Are you using Augmented Reality (AR) for Learning and Development? No, because you don't have the budget? This article focuses on adding value by connecting the scavenger hunt type physical world activities with the augmented one. Lower-Budget Augmented Reality: Is It Even Possible? Augmented Reality (AR)  means that using a phone or tablet, your physical world is augmented by a computer-generated layer, as if that augmented layer was actually there (like Pokémon Go). 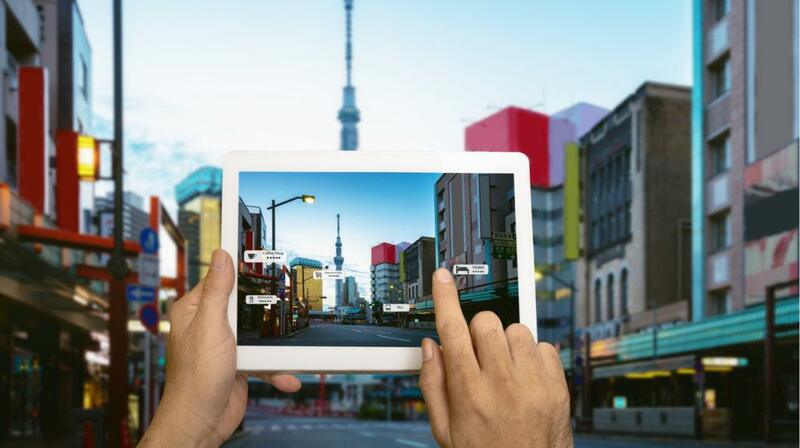 What Is Location-Based Augmented Reality, And Why Would You Use It? Location-based means your experience is driven by your GPS location. Combining the two, you can design experiences where players need to get to a physical location to interact with the augmented one. But what if you have neither the budget nor the technical skills to create immersive AR games? Where do you start? There's a range of experiences you can design from simply using AR to play a video triggered by physical location (like a QR code) through manipulating 3D objects. The question is how you can create meaningful AR experiences while sticking to a lower budget. Can We Create Meaningful Lower Budget Augmented Reality Experiences? Sometimes, you can't compete with high-end commercial Augmented Reality games. Sometimes, you don't even have the budget to an immersive, professional AR experience. What then? Focus on the practicality part of AR. Explore the concept of connecting the user's physical world and the augmented one to add value that wasn't there before. A team of new hires is exploring the workplace. They're using their phones to hunt for clues outside. The experience leads them through various buildings and outdoor sites. They arrive at a statue, and the location-based app unlocks the clue to pop a question. But wait, what happened to the quote at the bottom of the statue? Did it turn into a morse code? Or maybe the statue itself turned into a 3D model they can interact with? It's not magic, it's location-based clue hunting, powered by Augmented Reality. It's your annual sales conference, you just introduced a new application. You want people to get familiar with the basics of the application. After a short demo (where everyone is bored while passively watching the expert walk-though), you announce a challenge. It's optional. Between sessions, teams wonder the halls and rooms of the event. They're looking for pictures on the wall that come to life when scanned through the app. As the pictures come alive, they ask a question. Correct answers gain more points. To be able to answer the questions, you have to use the new application. And so, without more passive walk-throughs, people are using the application just to find answers. A leaderboard shows their points gained through the hunt. It's onboarding. Time to talk about the dreaded company history. Yes, it's important, but overall, that's probably the least useful thing right now during the information dump. It's like telling your kids about the time when there was no internet... However, this time, it's an escape room. More precisely, escape the past! You don't actually have to go anywhere but stand around the gameboard where pictures, icons, images, and other blasts from the past come alive. It's a race against time, not a race against each other! You have 10 minutes to escape the past and return to the present on the game board. Each member of the onboarding team can solve clues on their own but they have to share information, otherwise, the team is doomed. Just like in real life! Augmented Reality combined with clue hunting on the physical gameboard brings people together as they race against time working as a team. How To Design And Develop An Augmented Reality Scavenger Hunt Activity? You will use 2 apps to create the experience: ClueKeeper and Zappar. ClueKeeper is a location-based app allowing you to create hunts with clues (scavenger hunts with puzzles). The app is extremely flexible concerning how you design your experience. You can have team members play simultaneously, where anyone can solve a clue, or you can designate one person to submit answers. You can design the experience outdoor using GPS coordinates, or indoor by turning off the location-based features. Clues can be locked, forcing the team to complete them in order, or completely open. Or anything in-between. For my session at the ATD International Conference and Expo, I designed the experience to start out with one clue visible, so the players can learn how to use the app. Then, once a team solved the first clue, the rest of the clues got unlocked. Zappar is an Augmented Reality app offering a different level of sophistication for users. If you're just starting out with Augmented Reality, you can use their online drag-and-drop builder. If you have more technical skills, you can download their Zapworks app that supports 3D objects as well. What's good about ClueKeeper is that the app has Zappar functionality integrated. You don't have to worry about loading codes and scanning objects. Your players just download one app: ClueKeeper. They don't need the Zappar app itself, it's all built-in within ClueKeeper. As a designer and developer, you still have to create the Augmented Reality experiences in Zappar first, and then select them in ClueKeeper. First, you can use old-fashioned paper, post-it notes, or whatever you prefer to design the experience. You will need to come up with a theme, a story that connects the individual clues. Think about it as creating a journey map players go through to reach their ultimate goal. Is it going to be outdoor and location-based? Or indoor? Is it an individual clue hunting or a team experience? Is it a linear story, or open access? Once you have the journey mapped out, you go to ClueKeeper and create the "framework" of your experience. You configure the type of experience, duration, etc. Then, you start adding the clues. Each clue is structured the same way: some information players need to get to the clue (either physical location or an answer like the bathroom code), the clue itself (which can be text-based, video-based, or Augmented Reality), and the correct answer. You can set up hints players can buy to avoid frustration. If you're building in Augmented Reality in the hunt, you create those experience first in Zappar. You can test them through the Zappar app itself, so you don't have to go back and forth between the two while you're developing. Once the Augmented Reality experiences are ready, go back to the ClueKeeper and simply select from the list (it will ask you to log in to Zappar once). Playtest!!! First, run through the experience yourself. This is a functional test to make sure everything works. Then bring some "friends" in, and have them go through the experience. Watch and observe. Only intervene when they get stuck. I can't emphasize playtesting enough!! Unless you're a magical designer, there are always holes in the initial design. It's an interactive process where progress should always trump perfection. Sometimes little things make a huge difference. For example, in my escape room activity, there was a picture of a classroom on the table for the teams to use. Players were supposed to scan the picture to see hidden clues. In the game flow, players were already holding this picture in their hand for an activity, so in my instructions, I simply said: "scanned the room" for hidden clues. Now, imagine my surprise in the middle of the game, when I see people standing up and scanning the room. The ACTUAL ROOM for hidden clues. Not just one person! Almost every team started scanning the physical room. So, lessons learned: be very specific with every word, and playest! Interested in more about what you can do with clue hunting and Augmented Reality? That's exactly we're exploring at DevLearn in Las Vegas in October 2018.